Un paradis pour les golfeurs! Profitez du luxe d'une station avec les conforts de la maison dans ce magnifique terrain de golf situé à Legacy Golf Course. La maison est méticuleusement meublée avec 1 lit King Size dans le maître, un lit Queen dans la chambre et un coupe tirez-lit queen. L'unité dispose de 3 écrans LCD, (1 dans chaque chambre) câble, de l'internet sans fil, 2 balcons et dans les lave-linge et sèche-linge de bains. Le condo est livré avec un garde-manger bien approvisionné avec toutes les écuries de base nécessaires pour vous aider à démarrer profiter de repas cuisinés à la maison et qui sont gratuits pour la quête à utiliser. S'il vous plaît utiliser l'épicerie et de gaz de la carte de réduction de la RFY pour profiter économiser sur l'épicerie et de gaz au cours de votre séjour à Phoenix. Le club de propriétaires est dans les 30 yards de la maison avec un accès rapide à la piscine, salle de fitness et salle de jeux chauffée. Après une partie de golf sur le parcours de golf Héritage détendre au restaurant de la 19e trou et un salon tous situés sur la propriété. Il est à proximité des commerces, restaurants et de l'aéroport. Vous ne voudrez pas rentrer à la maison! Another great get away at Legacy! This is our second stay at Barry and Srie's Legacy Cachet Condo. We love the area and can't wait to go back again next winter! The condo is in a very safe and secure gated community, with lovely trails for walking. 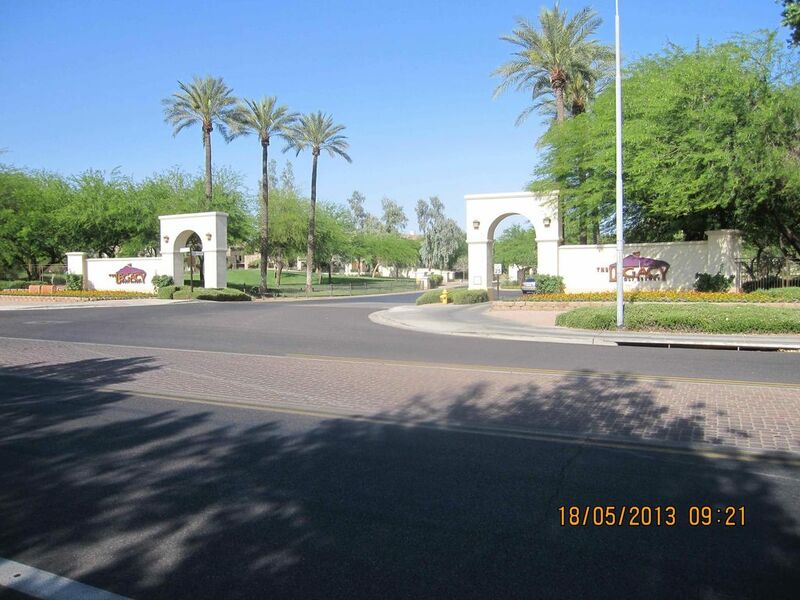 It is in a terrific location and close to restaurants, grocery shopping, golf courses (including Legacy Golf course). Many spring training facilities are nearby if you are a baseball fan and there in March. The condo is literally a 10 min drive to the airport so very convenient. The bedrooms both have TV's and extremely comfortable mattresses! The kitchen is very well stocked with plenty of glasses/cutlery/mugs/plates and bowls, as well as an ample supply of cook ware. The pantry is always well stocked with spices and anything left can be used by the next renter. Barry is just wonderful to deal with! He gets back to you very quickly if there are any concerns or questions. Look forward to being back in the desert and this lovely condo! Thank you Janet and John for the excellent review, it's always gratifying to know that we looked after our quests to the best of our ability. The unit itself is located on the second level, meaning you must climb a fairly long, steep set of stairs to enter the home, which could be problematic for someone with medical troubles. The condo is a good size and has two nice balconies. The pool area is quite lovely and serene. My only complaint about the home was the noise of the garage doors. They are extremely loud and are located directly below one bedroom and the dining area. When I booked the condo for 5 months, I was charged a higher amount than what Barry and I had agreed upon. He quickly got this adjusted and explained this was a mistake on HomeAway's side. My credit card was charged a foreign transaction fee amounting to about $300 and the rep I dealt with was quite slow and unwilling to help. Upon arrival, all shades were closed. When opening the living room blinds, the center window's shade broke. Barry contacted someone to fix it; unfortunately, it took 2 weeks for him to arrive. When I climbed into bed the first night, I pulled the bedding back and the sheets were very stained. It looked as if someone had spilled a bowl of spaghetti sauce (I'm hoping that's what it was!) on the linens. There was also a long tear in the sheet at the foot of the bed and the linens did not smell clean. I emailed Barry and Srie about this, including photos, but never received a response. The previous guest had some red wine explode in the freezer. This had not been cleaned at all by them or the cleaners and I cleaned it out. On my first full day, I discovered a light burned out in the master bath. They had several spares on hand but none that fit here. I purchased a new bulb and replaced it, to which Barry insisted he would compensate me for. Barry and Srie were typically good about responding to my messages. One was that I was having a minor problem with roaches. I purchased some spray and frequently sprayed around the garage, driveway, and entryway. Again, Barry said he would reimburse me for this. One night, I took some garbage to the garage and closed the door behind me. I wound up locked out and had to get a locksmith.He said the lock was going bad and demonstrated how it was randomly locking. Barry did follow through and sent me a check for the cost of the locksmith. Before entering into a contract, I asked what would happen if I wound up cutting my stay short. Barry assured me I would be refunded for the time not stayed. I notified them Dec 6 that I would be leaving 5 days early. Great place and even greater value! Having had 44 nights to get to know the property, I'm pretty certain I can say I absolutely loved it! This spacious corner unit is well positioned close to the entry/exit gate (controlled access) and community pool and recreation area. It's only 5 miles south of the airport and centrally located with easy access to shopping, dining, and freeways. Upon entering through the front door, you're greeted by a wide, open stair case, easily twice the width of most townhomes that I've seen. The stairs sweep to the right, opening up to main level of the home. Wow! The dark hardwood floors easily reflect the sunlight filtering through solar shades, and complimenting the high ceilings. The living room and dining room combo have a cavernous feeling, if a cave had sliding glass doors and windows. This place is big. The bedrooms are very spacious as well, with the master having a walk-in closet, separate W/C, and a very large shower. The 2nd bedroom had its own balcony on the corner of the building and was roomy as well. The kitchen was well stocked with various cooking items left by previous guests as was the laundry room with full-size washer and dryer. Overall, the property was in fantastic shape, super comfortable and best of all, COOL. The A/C was fantastic in the 115+ degree heat. Also cool, the owners. I had few issues but they were still very responsive. Thanks, Barry! Thank you Patrick for your very kind review of your condo it's really apprecated. Srie and I always provide our quests with immediate response to any of their questions or concerns. Patrick's comments about the design of the condo is what attracted my wife and I to purchase the condo. Thank you Patrick for staying with us and you are welcome back at any time. We stayed from March 1 through the end of April, used every part of the complex, and felt as if we were at our own home. The main tv is huge, the kitchen and all furnishings are modern and extremely we'll equipped, both bedrooms are comfortable, and the beds the same. It's quiet, upscale, safe, clean and affordable. The owner cares, and is always available, as he quickly helped us remedy a simple problem with the blender. The pool was always well kept and nicely heated. The fitness area has everything you would want, and it was normally empty, so we used it 3x a week. All of our guests, fellow Canadians vacationing in different areas of Phoenix, agreed it was better than their own, and they prefer upscale! We have used VRBO 7 or 8 times in the last 5 years, and this was our best stay to date. It's how VRBO is supposed to be. Thank you for the wonderful review. It was our pleasure to serve you and we were glad to hear that you were very satisfied with the immediate action that we took when the kitchen blender malfunctioned. We would love for you to be a returning guest as we enjoyed the interaction that we had during your stay. Our condo rental costs are very reasonable and rate adjustments are made depending on the season. Barry is the consummate gentleman. His condo is conveniently located near I-10 for easy access to all of Phoenix and the surrounding areas. It is tastefully decorated, clean, and located in a quiet gated community. There is a serene community pool as well as a private club house and exercise room. I stayed there for several months while my new house was in the final stages of construction, and highly recommend this condo to my friends and anyone interested in a great place to stay while in Phoenix. Barry is quick to respond to all queries. Thank you Ken for your kind comments. Our first responsibility has always been to our quests because they have placed their trust in us by renting our facility. It was pleasure having you and your family during your tanssition period to your new home. The condo was great and the owners are lovely people. Would defintely issue again! Thank you for the excellant review, it's really appreciated. We make an effort to ensure that any quests concerns or questions are given immediate attention and resolved to the quests satisfaction. Situé sur la belle championnat Legacy Golf Course qui offre une expérience de golf haut de gamme. Un emplacement idéal pour les escapades de golf, cours abrite également Raven Golf Club - un des 50 meilleurs parcours en Amérique. Full and complete details of the security gate entrance and front door lock box codes and 4 other pages of pertinent condo information is sent to the renter via email.